With a history dating back to the 12th century, this is certainly a place of extraordinary heritage value. How much of that original structure remains is hard to ascertain, but it was originally an Arab home (rendet gebuni) and played a role in defending the area from Barbary pirates. Moreover, The Knights of the Order of San Giovanni - based in Malta - were known to have inhabited the building during the early XVI century. Indeed, recent restoration work revealed a passageway they would likely have used. The hotel boasts plenty of original architectural detail, with suites such as the Torre del Canonico, Frate Nero, and Della Guardia all possessing different features. 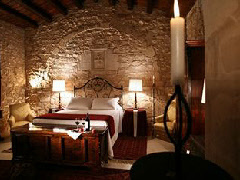 It is rated 5-star and is located just a couple of miles to the south west of Ragusa itself.